30sqm, fully equipped, simple, pleasant, wooden deck. 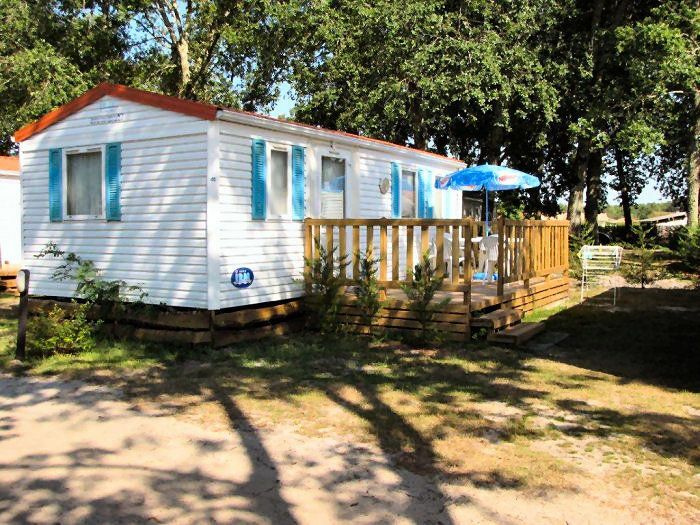 Located in Lesperon in the heart of the Landes between land and sea, camping Lou Payou ** welcomes you in a warm and family atmosphere under the freshness of pines. This campsite has a swimming pool, a snack bar, a petanque court, a playground for children and many other activities to practice: & nbsp; a table football, a ping pong table and a space & nbsp; TV. For the comfort of its guests, a barbecue, a laundry, a wifi point, a snack bar are also available. In season evenings with themes and animated are organized and will punctuate your stay. Mobile Home 6 persons of 30m², composed of a lounge area with a sofa bed (sleeps 2), a bedroom with a double bed, a bedroom with 2 single beds, a fully equipped kitchen area, a bathroom with shower and separate WC. Wooden terrace with garden furniture. The kitchen of this mobile home is equipped with a microwave and hotplates, a refrigerator and a coffee maker. Fully equipped dining area, table, complete crockery for 6 people. Each bed is equipped with blankets and pillows. From Paris (700km) or Bordeaux on the N10, take exit No. 13, direction Lesperon, Tartas, Lit et Mixe at Le Souquet. After 1 km take the road of Cepes.